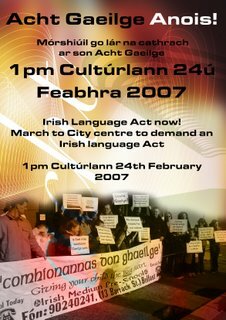 Beidh mórshiúil go lár chathair Bhéal Feirste ag tarlú Dé Sathairn 24ú Feabhra, é eagraithe ag eagrais éagsúla atá ag éileamh Acht Gaeilge do na Sé Chondae. Beidh daoine ag bualadh le chéile lasmuigh de Chultúrlann Mc Adam Ó Fiaich ar Bhóthar na bhFál le fágáil ag 1in ar an lá. 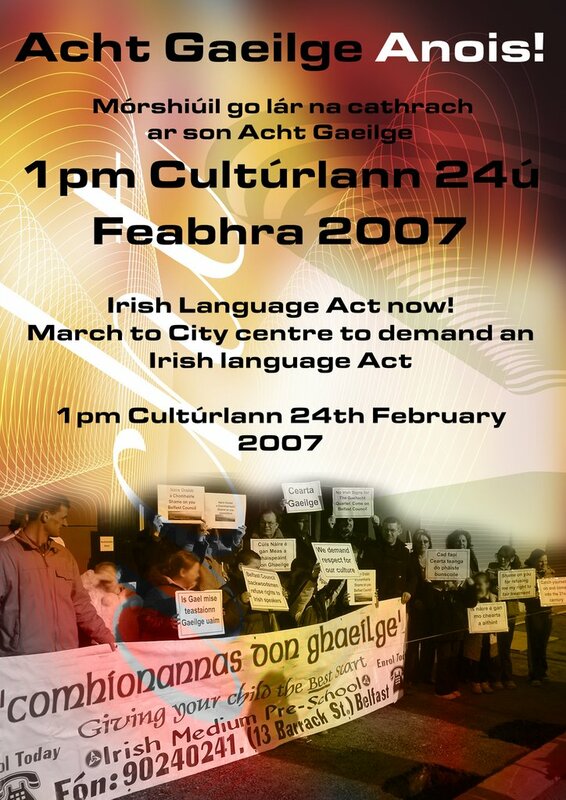 This entry was posted on Dé Sathairn, 3 Feabhra, 2007 at 21:00 and is filed under Acht Gaeilge, Cearta Gael. You can follow any responses to this entry through the RSS 2.0 feed. You can leave a response, or trackback from your own site.